It has not been confirmed if parliamentary approval is needed. SWEDEN WILL RECOGNISE a new Palestinian state, the Nordic country’s new prime minister Stefan Loefven said today, underlining his support for a two-state solution to the Israeli-Palestinian conflict. “A two-state solution requires mutual recognition and the will to co-exist peacefully,” Loefven said in his inaugural address to parliament. This should take place with respect for the “legitimate demands of the Palestinians and the Israelis as regards their right to self-determination and security”, he added. According to an AFP count, at least 112 countries around the world have recognised a Palestinian state. A Palestinian count puts the number at 134. Iceland is so far the only western European nation among them. 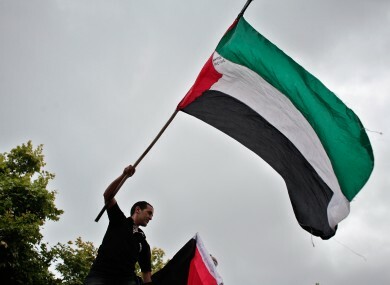 Among EU members, countries that have recognised a Palestinian state include Bulgaria, Cyprus, the Czech Republic, Hungary, Malta, Poland and Romania. Loefven’s Social Democratic-Green Party coalition — which formed a minority government on Friday — is more supportive of demands for a Palestinian state than the previous centre-right administration. The Social Democrats, the largest party in the Swedish parliament, wrote in their election manifesto that “Israel’s war crimes must be investigated and the occupation of Gaza lifted”. The party added that “Sweden and the rest of the world must actively support its (Palestine’s) work towards reconciliation”. The prime minister did not specify whether the policy would be submitted to a vote in parliament. Sweden’s foreign ministry declined comment when asked by AFP if parliamentary approval was necessary. Sweden voted in favour of Palestinian observer status at the United Nations in 2012, which was granted despite opposition from the United States and other countries. The Swedish announcement coincided with the start of the Jewish holiday Yom Kippur, and an Israeli government spokesman was not immediately available for comment. Email “Sweden to recognise a new Palestinian state”. Feedback on “Sweden to recognise a new Palestinian state”.